Hen & Stag Special Packages! If you don't like having to go through the smaller details of picking how many activities you would like to do, what breakfast/lunch you would like to add to keep everyone happy and gathering a kitty prior to your arrival for drinks after your activities, this is THE PACKAGE FOR YOU! 9am- Arrive at Lochter and enjoy freshly prepared bacon rolls with a cup of tea/coffee. The perfect way to get you fuelled up for a morning of exciting activities. You will get to choose (prior to arrival) 4 Fast and Furiously competitive activities to do. Once all of these are completed, pop back inside where we will serve you a delicious, freshly prepared lunch and a glass of bubbly for everyone attending.... ALL for just £95pp. Click here for more information on the Hen Day Special. Again, you will be able to choose 4 activities of your choice from our full list. The competition is ON! 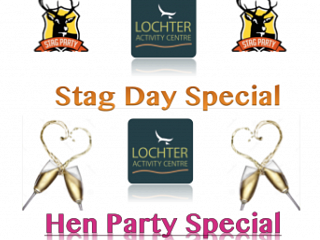 Click here for more information on the Stag Day Special.